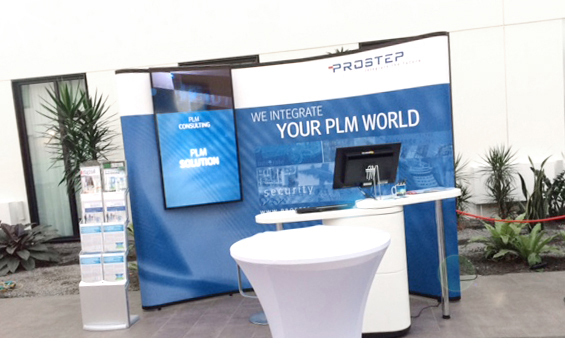 The Systems Engineering Day (TdSE) is to systems engineering experts what the prostep ivip Symposium is to PLM. From the 5th to the 7th of November, more than 400 representatives from industry and research came together in Berlin to discuss problems and solutions relating to systems engineering. PROSTEP has been active at TdSE for years and this year's presence featured a booth and two presentations. This year, the TdSE was held concurrently with the biennial meeting of the EMEA Sector of INCOSE (International Council on Systems Engineering), which underscores the importance of the event. For three days, we took the opportunity to showcase our wide range of services, from technology-neutral strategy consulting and process optimization to concrete solution implementation. But that wasn't all: At the booth and in the presentations, we also conveyed the enthusiasm of our staff, our holistic approach and our broad methodological and technological knowledge of systems engineering and related topics such as validation and verification, IoT and traceability. And we had some persuasive arguments on our side: our networking with standardization bodies such as prostep ivip, VDA, OMG and GfSE, our comprehensive expertise in different industries and with companies of different sizes, and our technology transfer capabilities. The first presentation looked at the results of the prostep ivip Association's SysML Workflow Forum project, which was coordinated by PROSTEP. Led by DAIMLER and Schaeffler, the group has set itself the goal of facilitating the industrial use of SysML, as there is a massive need for action here. To this end, requirements for the use and improvement of SysML and the IT modeling tools are collected on the basis of use cases and interoperability tests are prepared. Unlike other committees, the group addresses complex, integrated scenarios, such as the development of the complete "Hybrid SUV Powertrain" system. In the second presentation, our two new colleagues, Veronica Haber and Tamara Hofmann, presented the initial findings of their master's theses. With measures such as these, we promote and challenge our young talent. In their work at Munich University, the two have expanded PROSTEP's artifact model to include the possibility of a holistic view of business processes. And this was another important, industry-relevant contribution – fresh and appealingly presented.